The spring-fed Kapakahi Stream flows from its headwaters, at the Hawaii Plantation Village, to the West Loch of Pearl Harbor. The Kapakahi Stream Watershed encompasses 280 acres and is part of the larger Kapakahi Watershed. Before entering Pearl Harbor, Kapakahi Stream flows through the Pouhala Marsh, a 70-acre tidal wetland that provides crucial habitat for several native plant and animal species, including the endangered Hawaiian Stilt. According to the Hawaii Nature Center, during non-breeding seasons, stilt numbers in the Pouhala Marsh can exceed 150 birds (10% of the remaining world population). 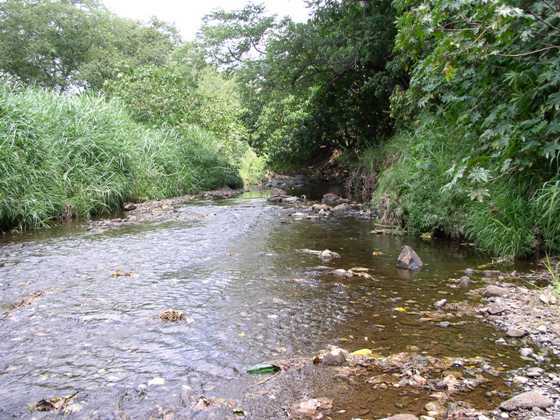 From December 2004 to May 2007, Oʻahu RC&D led an effort to develop a watershed based plan for the Kapakahi Stream. Tetra Tech EM, Inc. was contracted to conduct a water quality assessment, including a watershed investigation, hydrologic analysis, water quality analysis, pollutant load estimates and site specific best management practices. Non-point sources of pollution like excess nutrients (nitrogen and phosphorus), sediments and an accumulation of household trash were threatening the stream’s health. The plan identified various steps needed to reduce the pollutants and restore the Kapakahi Stream Watershed and the surrounding area. The Kapakahi Stream Watershed project emphasized community involvement and participation, integrating a wide variety of partners in the Waipahu Community. The City and County of Honolulu replaced 2200 feet of old sewer line in the headwaters of the watershed. Additional sewer lines are scheduled for replacement as funds become available. It is believed that degraded sewer lines were contributing nutrients to the watershed. The Waipahu High School, Aiea Intermediate School, Campbell High School, Leeward Community College, The Hawaii Nature Center and the City and County of Honolulu Environmental Services joined forces to restore Kapakahi Watershed through community and classroom education. By providing tools, materials and incentives, people of all ages gained a better understanding of the watershed and learned habits to protect and care for the land and waters in their community. The Waipahu Community Association completed renovation and opened the Waipahu Festival Marketplace, a key to the revitalization of Waipahu Town Center. Department of Land and Natural Resources (Division of Forestry and Wildlife) led efforts restoring the Pouhala Marsh to a functioning wetland through the removal of non-native mangroves and the establishment of native plants. By improving the stream’s water quality, community access, stream aesthetics, and ecological functions, the Kapakahi Stream can be a keystone for continued community renewal. Future plans include construction of a 1500 foot walkway along Kapakahi Stream that will link the Waipahu Town Center to Hawaii’s Plantation Village and Cultural Garden Park. The streamwalk will integrate cultural and natural resources while increasing community awareness and appreciation of the Kapakahi Stream. A full copy of the Watershed-Based Plan for the Kapakahi Stream can be downloaded here.